• While we call this service "Day Of Coordination" we actually start approximately six weeks before your wedding. • We meet with you to get as much information as possible so we know exactly what should be going on with every detail. • We develop an in depth itinerary so that your vendors, wedding party, venue, etc. are all literally on the same page when it comes to when, what and where. • We organize your ceremony processional and take care of ceremony set up including unity candle, reserved signs, etc. 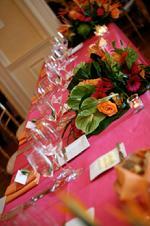 • We take care of reception set up including seating cards, favours, centrepieces, etc. • We liaise with your vendors and venue leaving you free to enjoy the day. • We liaise with your MC and take care of timing so that things flow smoothly. • We attend the rehearsal and can even coordinate the rehearsal if the officiant is not available. • We provide an emergency bag filled with necessities such as ibuprofen, pins, bandages, stain remover, sewing kit and much, much more. • We generally provide both a Coordinator and an Assistant Coordinator for each wedding. Our Coordinators are fully trained and certified. We always have back up in case of emergency. • Elan Weddings has been helping couples enjoy their wedding day since 2001. Contact us today for a free initial consultation. Wedding Day Coordination in the Greater Toronto Area starts at $1200. © 2019 Elan Wedding Consultants Inc.